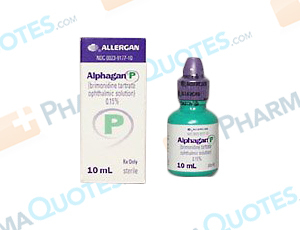 Alphagan P is an ophthalmic (eye) medication used to treat open angle glaucoma or high fluid pressure in the eye. Alphagan P works by allowing better fluid drainage from within the eye and reducing the amount of fluid formed in the eye, thereby lowering pressure. This and other drugs should be used under the direction of a doctor with a complete and current list of medications and medical history. Remove contact lenses before administering this medication. Patients with an allergy to Alphagan P or apraclonidine may have an allergic reaction to this product. Tell your doctor before using this product if you have a history of blood vessel disease, blood circulation disorders, depression, severe heart disease, kidney or liver disease, Raynaud’s disease, or orthostatic hypotension. At onset of treatment, patients may experience eye discomfort, itching, redness, blurred vision, dizziness, dry mouth, bad taste in the mouth, or drowsiness. These effects should subside. If they worsen or persist, tell your doctor. Do not stop, start, or change the dosage of this medication without talking with a doctor. It’s important to follow manufacturer, pharmacy, and doctor’s instructions when using this and other medical products. General Alphagan P Warning: The above information is for informational purposes only and is not meant to be a substitute for professional medical advice, diagnosis or treatment. Please seek professional medical advice before starting, changing or terminating any medical treatment. Pharmaquotes is not offering medical advice, pharmaceutical recommendations or endorsing any specific prescription drug, pharmacy or other information on the site. Pharmaquotes provides no warranty or guarantee for any of the discount data, medication, or other information.